In a sign that America’s manufacturing continues to contribute to economic growth, factory orders climbed in June for the fourth time in five months. The Commerce Department reported a bigger increase than analysts expected, with broad gains across categories and greater investments by businesses. The growth of America’s non-manufacturing sector accelerated more than expected in August to the highest level since the end of 2005. The Institute for Supply Management reported the economy’s largest sector expanded for the 54th month in a row. Of 18 industries surveyed, only utilities indicated a drop in business. 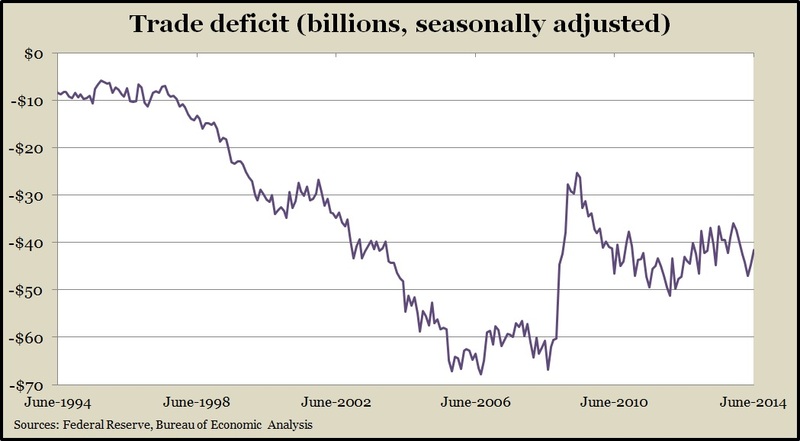 The U.S. trade deficit narrowed more than expected in June as exports edged up to another record high and imports receded, mostly because of a decline in oil imports. According to the Bureau of Economic Analysis, the gap between exports and imports was the lowest since January. Led by increased domestic energy capacity, imported oil fell to its lowest level since November 2010. The amount of consumer credit outstanding kept growing in June, reaching another a new peak again led by non-revolving debt for student loans and vehicle financing. The Federal Reserve reported that revolving credit, which includes credit cards, rose the least in four months, suggesting continued reluctance by consumers to take on more debt. The four-week moving average of initial unemployment claims feel for the fifth week in a row, reaching the lowest level since February 2006, before the Great Recession. Labor Department data show new jobless claims staying below the long-term average since the beginning of 2013, showing employers’ reluctance to let workers go. Businesses remained fairly conservative with wholesale inventories in June, keeping their buildup of supplies just below the growth rate of sales. The Commerce Department showed the inventories-to-sales ratio at the same relatively lean level as in May. The Bureau of Labor Statistics said productivity rebounded to an annual rate of 2.5% in the second quarter after dropping 4.5% in the first three months of the year. Output rose by 5.2% in the latest quarter, while hours worked grew 2.7%. The cost of labor fell as output grew. Wages rose 0.1% after adjusting for inflation.